The expert technicians at Gough Heating and Air Conditioning are just the people you want on the job, bringing you a cleaner, healthier future! Whether new or old, our team of highly qualified technicians are dedicated to getting the best performance out of your equipment. We provide a thorough cleaning of your home’s entire duct system, without surprise additional costs associated with not taking proper precautions. What single thing in your home takes up the most space? And what is the one thing that you consume more of than anything else every day? Answering these questions with “air” might make it seem like a cop-out, as if they were trick questions, but it’s simply the honest truth. Each person is estimated to inhale between 2,900 and 3,500 gallons of air per day—are you satisfied with the air you fill your lungs with every moment you spend in your home? Is it clean? Is it humid enough? Warm or cool enough? 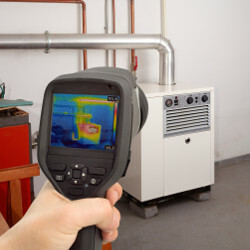 But while you turn a blind eye, your faulty heating, ventilation, and air conditioning system could be compromising your daily comfort, your finances, and even your and your family’s health. If your furnaces or A/C unit are out of date or your vents haven’t been cleaned in years, your system isn’t operating at peak efficiency, and may struggle to heat or cool your home consistently. 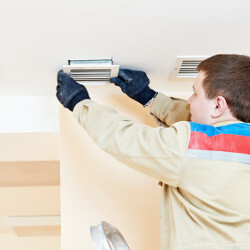 If you experience pockets of heat or cold in different parts of your home, your ventilation system isn’t circulating air properly and probably needs maintenance. At the same time, not operating at top efficiency not only makes your home less comfortable, it also robs you of money every month the situation remains. As your system works hard to overcome age and neglect, it uses more energy than necessary, leading to higher energy bills for you. 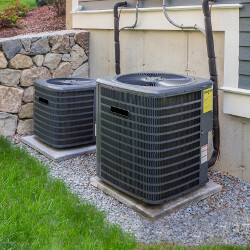 But most importantly, a poorly-maintained HVAC system poses a threat to your well-being, potentially inflicting a range of common long-term health issues. The EPA names indoor air pollution as one of the top environmental risks to public health, responsible for 94% of respiratory problems. Leaving your ventilation system in disrepair allows dust and other pollutants to build up, increasing the risks for you and especially your children to develop allergies, asthma, and other issues. These shouldn’t be consequences you’re willing to passively accept and live with. You and your family deserve better. And with fifty years of experience servicing the indoor air quality needs of our community, the expert technicians at Gough Heating and Air Conditioning are just the people you want on the job, bringing you a cleaner, healthier future. We offer a complete range of products and services to address every potential problem with your HVAC system. Our certified technicians are trained to install and replace furnaces, air conditioners, heat pumps, boilers, humidifiers, ducts, and more. 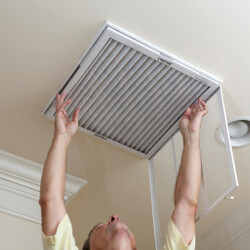 We service all brands of equipment, perform annual maintenance to keep your system running like the day it was installed, and offer duct cleaning services to clear your ducts of years of accumulated dust. All of these services are delivered with an emphasis on convenience. In an effort to keep the process as painless as possible, we’re ready to provide you free estimates, speedy project completion, and a commitment to being communicative and responsive. In a world of stuffy, hard-to-work-with contractors, Gough is a breath of fresh air. "I have used Gough heating and air conditioning several times and have been impressed with their service. Dave came right out after hours to help me and saved the day when my furnace broke down on the coldest day of the year. Now I have them service my stuff every year and they run perfect. I would strongly recommend them." "This is truly an A+ business. Had new furnace and central air installed at my residence and not only were they reasonably priced, but they were professional, detail oriented, and even handled the Comed, and Nicor rebate process for me. Highly recommended!" 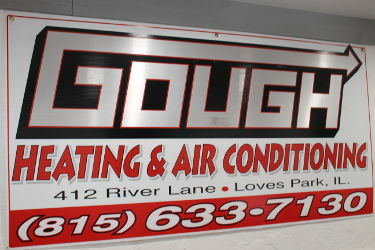 "Gough Heating & Air Conditioning is our "GO TO" whenever we had furnace or A/C problems. We had need for A/C service early this morning; I called Gough at 7:30am, they had a serviceman here within an hour. Problem was quickly fixed - and the rates are very reasonable."